Combine chives, parsley, nuts and garlic in food processor until finely chopped (use pulse). Gradually add olive oil. Transfer to small bowl. Add lemon juice and stir. Add 1-2 tbsp water if needed. Salt and pepper to taste. fresh fish (steelhead trout) or stripe bass, cod, etc. Skin-on is nice. Sauté fish in olive oil and/or butter. Then sprinkle with fresh lemon juice, salt, and pepper. 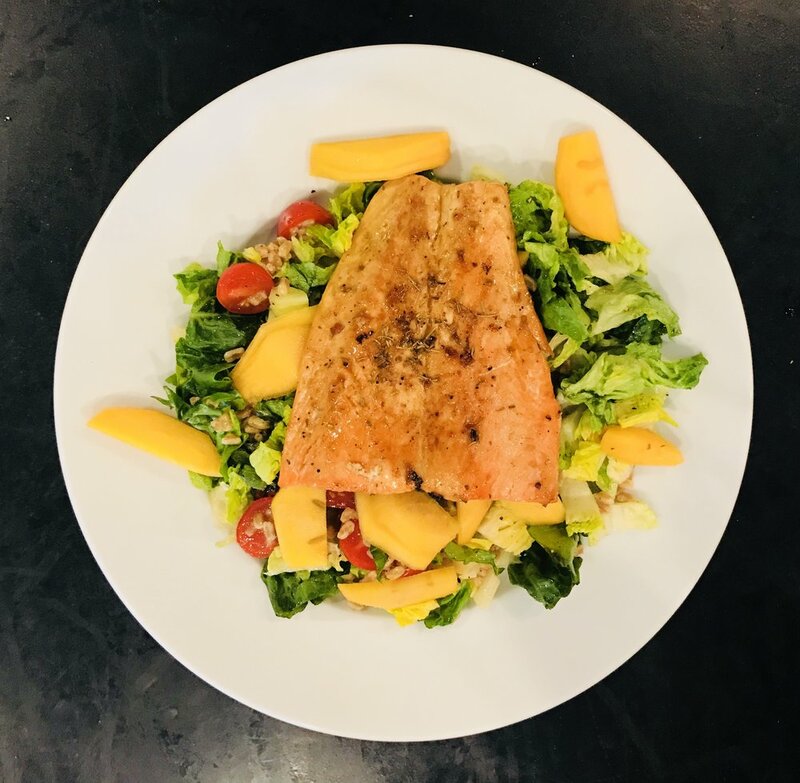 Arrange fish atop mixed greens, halved cherry tomatoes, sliced persimmon, and a sprinkling of cooked farro that has been drizzled with lemon vinaigrette, salt, and plenty of fresh ground pepper. Sauté the tomatoes in olive oil, add the yellow peppers and the olives or capers. After a few minutes, lay the fish down and put a top over it. 10 minutes later, serve and eat.